Home/Trademark/Can You Trademark a Hashtag? Is a Hashtag something you can Trademark? Background: Originally developed on Twitter, a hashtag is a word or a phrase following the pound sign “#phrase” used to categorize messages on social media relating to a specific topic the phrase. Hashtags have become an important aspect of social media. Their presence can be seen on social media platforms such as Facebook, Instagram, YouTube, Pinterest and more. Hashtags function like a search key word and when searched will produce all messages and photos tagged with the #hashtag. Hashtags are used by individuals, celebrities, politicians, companies, television shows, radio shows, podcasts, YouTube channels and more to gather messages together under a specific topic the phrase. Consumers can use them to rate products or services and even to promote a product, service, or business. Law: According to the Trademark Manual of Examining Procedure, a “hashtag” is a form of metadata consisting of a word or phrase prefixed with the symbol “#” (e.g., #chicago, #sewing, and #supremecourtdecisions). Hashtags are often used on social-networking sites to identify or facilitate a search for a keyword or topic of interest. See Dictionary.com, search of “hashtag,” http://dictionary.reference.com/browse/hashtag (June 19, 2013) (citing Random House Dictionary). A mark consisting of or containing the hash symbol (#) or the term HASHTAG is registrable as a trademark or service mark only if it functions as an identifier of the source of the applicant’s goods or services. Generally, the hash symbol and the wording HASHTAG do not provide any source-indicating function because they merely facilitate categorization and searching within online social media (i.e., social-media participants are directed to search a particular subject. Conclusion: Therefore, general Trademark rules apply. 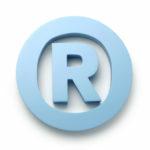 If a mark consists of the hash symbol or the term HASHTAG combined with wording that is merely descriptive or generic for the goods or services, the entire mark must be refused as merely descriptive or generic. Also trademark must functions as an identifier of the source of the applicant’s goods or services, if not then not trademarkable.